Do you think Santa Claus suddenly appeared one day just the way kids see him today? Is it possible he was once a skinny young man with a brown beard? Did he insist on making all the toys himself? Was his sleigh pulled by the largest moose, which fought for the privilege of pulling the sleigh? Was Mrs. Claus a terrible cook? 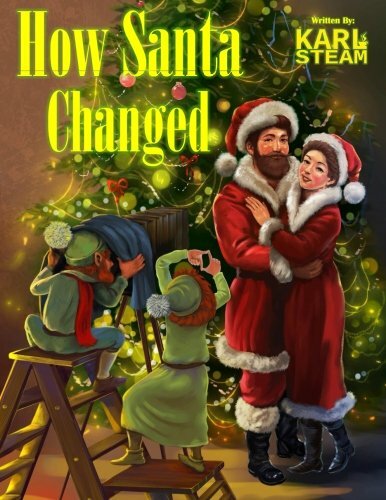 Steam says all of this is possible in this charming, rhyming story. As Santa grew older, his beard whitened. As the world’s population grew, his sleigh got too heavy for one belligerent moose and the toys too numerous to make on Santa’s own. And Mrs. Claus learned to make delicious cookies as she read tips about baking, adding to Santa’s round belly. Illustrated in rich colors, this is a wonderful read aloud for this time of the year, or actually for any time, as kids learn about working together and about how things become the way they are. Each spread shows details for kids to spot, such as a family portrait or the title of the book Mrs. Claus is reading. Steam’s website (https://www.karlsteam.com/) includes classroom resources.